Poetry is all around us! 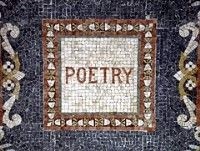 "April is in full swing, which means National Poetry Month is upon us. Teachers are already planning units and themed studies surrounding verse. We librarians are the ones that they come to for new ideas. "Do you have any suggestions?" they ask. This is when you smugly smile and say, "As a matter of fact, I do!"...."